Malmesbury. | Create Landscaping Malmesbury. We were requested by an elderly lady, who lives alone to come up with a solution for her small back garden, it was just 7.5m x 4m. Her brief to us what that she would like a maintenance free garden, but didn't want it just slabbed. We suggested using artificial grass. 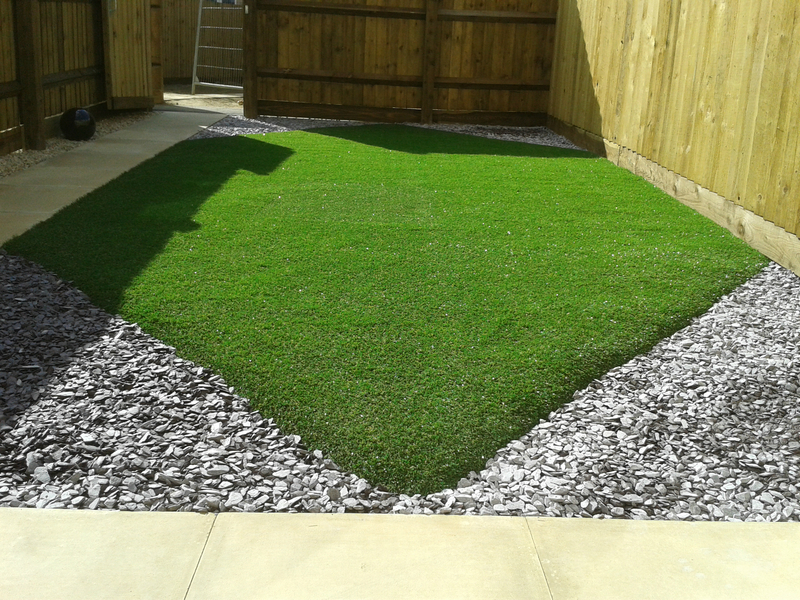 After looking at some samples and choosing the type of grass she would like, we set about designing the garden.Our client wanted a diamond shaped 'Lawn' with the corners filled with plum slate. We set about levelling the ground and marking out the diamond shape. At this poiunt our client changed her mind and wanted a slightly different shape, which we were happy to oblige her with (we believe in being flexible with our designs). The scalpings were laid and compacted with whacker plates to give a good solid base. We then topped this with 6mm pea gravel to give a smoother surface and assist with the drainage. Wooden battens were set in place to attach the artificial grass to. The 'Grass' was then unrolled, cut to shape and securely anchored into place. The finishing touch was the plum slate laid to the four corners. Both ourselves and our client are extremely happy that we were able to fulfil her wishes and create the maintenance free garden she desired. This project was completed by two people in just one day. This type of grass is becoming so popular and looks much more realistic than the old greengrocer type grass. Great Job. Looks very nice, just the type of low maintenance garden I need. How do you keep this looking good though? Do you need to hoover it or hose it down to keep it clean? Looks god and easy to maintain. There is definitely a place for this fake grass, it has been so much improved over the years. It can make for a really maintenance free garden for those who are unable or who are just to busy to garden.